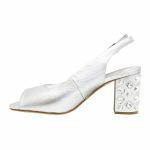 Stand out from the crowd with the gorgeous peep-toe slingback block heel FREIDA by Django & Juliette. 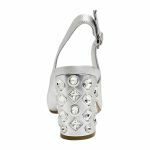 It's one to wow the crowd in as you will sparkle and shine with every step. The soft leather will hug your foot and the padding will make sure that you're comfortable all night long.